When These Two Men Started To Fight On The Subway, You’ll Never Guess How The Passengers React!! Okay, so technically it’s a battle of the saxophones, but it’s still really incredible! If you’ve ever been on a subway, you know the atmosphere you’re walking into. It’s not always as tense as a 15 floor elevator ride with strangers, but it’s the same concept. Everyone usually keeps to themselves and occasionally a tourist or someone who’s lost might ask for directions, but for the most part, the subway is a quiet trip. It’s just people trying to get home, to work, to school, or to run errands and they don’t feel like bothering anyone around them. And sometimes you’ll have something so powerful, like the battle going on here, that gets the entire subway car riled up and excited to be human again! Yes, typically musicians on the subway are ignored or barely tolerated – but when this young saxophone player started to play a familiar tune, it just so happened that another saxophone player was on that same car and knew that same tune! As soon as the second musician came waltzing up the isle to play an accompanying part, the crowd went insane! 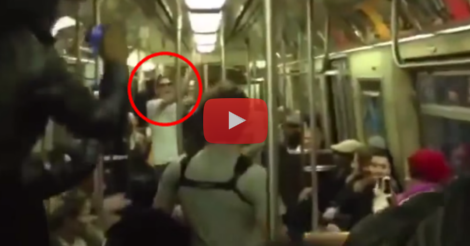 I’ve never seen a reaction quite like this on the subway – it really took me by surprise. To see everyone participating was really intense…this something that you just have to see for yourself! This video is clever in that it took several videos posted by people on the car and edited them all together for a seamless and unique video! How cool! This Mom Hasn’t Heard From Her Son In Weeks…She Decided To Remind Him Who She Is! Hilarious!